SKINWALKERS are a band of people, for the people; a no-restriction mentality smashing out political, emotionally-charged rock n roll with a message about the world. Their music holds no allegiance to any specific genre or style, blurring the lines on how to define the band as anything other than SKINWALKERS. 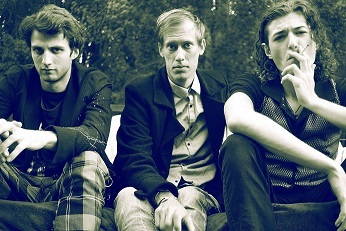 Forming the group in 2008, Lach Jenno (Guitar/Vocals), Matt Turner (Drums/Vocals) and Lenny Delandre (Bass / Vocals) have released 2 EP’s and 4 singles since their inception, all produced by Kalju Tonuma. Rounding out 2013 they release their new single Fateless, with an EP to follow. Since their first national tour in 2011, the band has supported the Misfits (USA), GrimSkunk (USA), The BellRays (USA), Frenzal Rhomb, The Datsuns and recently performing at Big Day Out on the Gold Coast. Following the release of the 2012 single, ‘Everyone Has A Story’, the band started a project that interacts with people from all walks of life around the world to share their story, beliefs and thoughts to those watching, which they aptly named after the song as the ‘Everyone Has A Story’ video series. Such names including Ben Lee, Lucius Borich, Kris Schroeder, Foster Gamble and more have appeared, with the project ongoing to date. The band is continuing to grow support with Australian community radio stations along with International online stations in the USA and Europe. Their social convictions were founded in the writing of their first EP, ‘We Are The Streets’. The lead track was inspired by the youth homelessness crisis in Australia. Captain Paul Moulds, the Director of the Oasis Youth Support Network in Sydney would acclaim the 2010 release of the ‘We Are The Streets’ EP as “a great example of how people are contributing in their own way to raise awareness and bring about change. – Single Fateless released through MGM 4th October 2013. – Single Cold Ghost Sun ~ Have We One through MGM 21st January 2013. – Single Everyone Has A Story released through MGM 7th September 2012. – Single I Don’t Believe It released through MGM 8th June 2012. – EP Fall or Resist released through MGM, 8th July 2011. – EP We Are the Streets released through MGM, 13th May 2011. – EP We Are the Streets released independently, 4th June 2010.